Sure WebOS is all but dead but the recent announcement by HP that it will be donating webOS to the opensource community has sparked a ray of hope to webOS fans. The HP Veer is probably not one's first choice for a smartphone but you can probably buy this one on eBay for less than $120 and that's a sweet price point. So does this small guy deserve a place even as a backup phone? Let's find out. There's no arguing that the HP Veer is the smallest smartphone around. With a 2.6 inch screen and weighing 130g, it's easy to forget that you have a phone in your pocket. On the right is the charging port which also serves as your headset jack when you put on the head adapter, top right is the power button, on top is the sim card slot and on the left is the volume button. When you slide the screen up, you'll be greeted with a full QWERTY keyboard. The keyboard has a nice tactile feel but anyone who has big fingers will have a hard time with the keyboard which is so cramped. When using the HP Veer, I have to constantly remind myself that I'm using a smartphone. 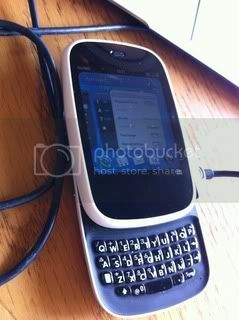 This phone does emails, it has an App store, document viewer, GPS, almost everything you can find on today's smartphone. However, the size just gets in the way of its usability as a smartphone. For one, document editing is really laughable on such a small screen and cramped keyboard, reading and sending emails is fine and it actually has a nice implementation on webOS, web browsing is also good considering that it has a small screen but the browser has flash and it too is usable if you want to take quick peeks at websites which has flash and which you can't view properly on your iOS devices. But my number one complaint against using the HP Veer as a smartphone is its speed. Its.just.too.darn.slow. Booting up takes almost a minute and although webOS has a good implementation of multitasking, once you have too many apps open, it just bogs down the phone. Sure, $120 is still too much to pay for a smartphone that's dead considering that there are android mobile phones for much less than that but if you're into hacking and hoping that android would be ported to the HP Veer, or if you're just curious about webOS and would like to try other platforms, or if you're just into zombies, well, then what's a few hundred bucks compared to the experience you've gained? I don't know how good is this webOS for phone but I bought discounted HP TouchPad with webOS and I was amazed how good is this system. The price tag of 99$ and for this price I got iPad like device with the same functionality but with less apps. It'' very amazing.